Since January 1, 2016 Cyfrowy Polsat S.A. complies with the corporate governance rules described in the document "Code of Best Practice for WSE Listed Companies 2016" attached to the resolution no. 26/1413/2015 of the Supervisory Board of the Warsaw Stock Exchange dated October 13, 2015. The document was prepared by the Warsaw Stock Exchange and is available in the WSE headquarters and disclosed on the website dedicated to corporate governance issues: http://www.corp-gov.gpw.pl. In compliance with principle I.Z.1.13 we publish a statement on compliance with the corporate governance recommendations and principles contained in the Code of Best Practice for WSE Listed Companies 2016. Every year, together with the annual report, the Company publishes a report on the application of the principles of corporate governance in the given year. If any rule from the "Code of Best Practice for WSE Listed Companies" is breached by us, we publish a current report regarding that issue. Polsat Group adopted the Diversity and Human Rights Respect Policy of Cyfrowy Polsat Group (the “Diversity Policy”) which has the purpose of supporting the pursuit of the Group’s business goals. The policy enables the Group to respond in a better way to the employees’ expectations, make full use of their potential and at the same time help the companies who are part of the Group to adjust to the changes occurring on the labor market. We trust that diversity is one of the sources of our competitive advantage, and competing views, opinions, work styles, skills and experience generate new quality and enable companies to achieve better business results. The basic principles of Polsat Group’s Diversity Policy include respect for human rights and prohibition of any discrimination due to gender, age, sexual orientation, competence, experience, potential degree of disability, nationality, ethnic and social origin, color of skin, language, parental status, religion, confession or lack of any confession, political views, or any other dimensions of diversity which are defined by valid law. The principles and the goals of Polsat Group’s Diversity Policy are regulated in the Group’s corporate documents, especially in the Code of Ethics, HR Policy, Work Regulations, Regulations of Anti-Mobbing Committee. The Diversity Policy is implemented, among others, by including diversity-related issues in HR processes and tools, such as organization of training and staff development sessions, recruitment and rewarding processes. An Ethics Ombudsman has been appointed in the Group whose tasks include, among others, the prevention of discrimination and mobbing. The provisions of Polsat Group’s Diversity Policy apply to all employees, including Management Board Members and Supervisory Board Members. 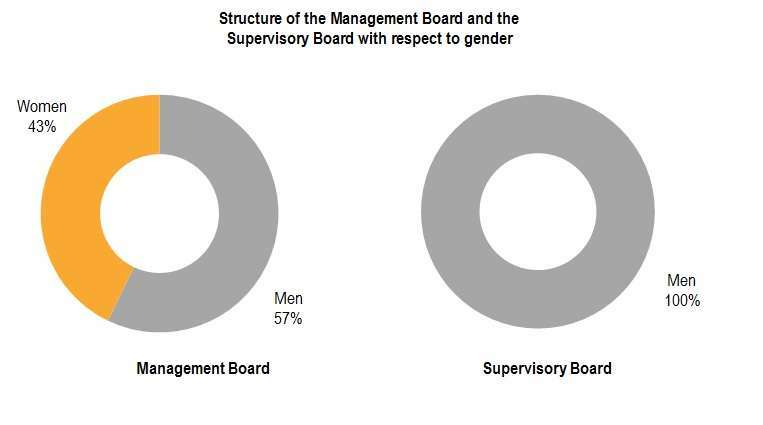 The diagrams below present the gender and age structures of the Members of the Management and Supervisory Boards of Cyfrowy Polsat. As at December 31, 2018 four men and three women sat on Cyfrowy Polsat’s Management Board while the Supervisory Board included seven men. Members of the Management Board and the Supervisory Board have education in such fields as management and marketing, law, economy, finance, or technical education as well as rich and diverse professional experience.